Apple and EMI stole the spotlight earlier this month with their DRM-free music announcement, but now Niveus and MusicGiants are teaming up to bring you the first joint HD music store. 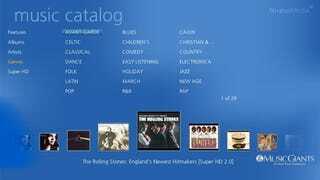 The store will let audiophiles listen to and download music in the Lossless WMA format at rates up to 1,100 kbps. You'll also be able to download "Super HD" songs—tunes remastered in DVD Audio or SACD in 5.1 surround or 2.0 stereo with sample rates at 11,000 kbps. The store, which will be integrated in Niveus' new Vista-based media centers, includes content from the big four (EMI, Sony/BMG, Universal and Warner). The majority of sales will be album-only, although I spotted a few singles going for $1.29 a pop. Another downside is that the store is Internet Explorer-only.